AUTO-RENEWAL (AR) By purchasing this product with AR, a payment method is required to put on file to activate. The payment will not be charged until after the initial subscription period. ONGOING PROTECTION This subscription will auto-renew so you never have a service disruption. If you do not wish to continue auto-renewal, you can cancel anytime. MOST AWARDED SECURITY BRAND EVER by PC Magazine. Norton Security is the 42x winner of PC Magazine's Editors Choice Award. McAfee Total Protection is the one-stop shop for digital protection, with award-winning cloud-based antivirus, intelligent web protection and cross-device compatibility to protect computers & mobile devices. Norton Security Premium – 10 Devices – 1 Year Pre-Paid Subscription requires a Credit Card or PayPal information for activation and use. * We will store your payment details but you won’t be charged until your next renewal period. You will get an email reminder before renewal and can cancel your automatic renewal at any time. Norton Security helps protect your devices against cybercriminals and scammers while you surf, bank, socialize and shop online. When you’re online, your devices may be susceptible to threats, such as ransomware that holds your files hostage, or spyware that captures your passwords. Norton Security is designed to recognize and help block those threats before they get to your device — helping to protect your private and financial information. Browse the web confidently while Norton Security helps block unsafe links, malicious downloads and virus- ridden websites. Our PASSWORD MANAGER creates, encrypts, and saves all your passwords, so you only have to remember one. STAY PROTECTED EVERYWHERE you go, at home, in a café, at the airport-everywhere-on ALL YOUR DEVICES with cloud-based protection against viruses and other online threats. There's Always a New Cybersecurity Threat - Let Webroot Help Nearly half of all consumers worldwide have been victims of cybercrime. Every link clicked, email opened, app downloaded, and network joined is an opportunity for hackers to compromise your personal data. Even established threats like ransomware are continuously evolving, and new threats like cryptojacking are being added to an already diverse threat landscape. Webroot offers complete protection from viruses and identity theft for all your devices, without slowing you down. 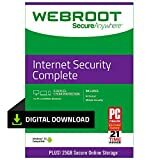 Powerful, lightweight, integrated protection for PC, Mac and Android, cloud-based Webroot Internet Security Complete with antivirus protects personal information by blocking the latest malware, phishing, and cyber-attacks. Being fully cloud-based allows Webroot to complete scans faster than our competitors, we scan billions of apps, files, and websites continuously to determine where and what is safe online. With real-time updates, Webroot protects against known and zero day threats. Internet Security Complete boasts added features such as 25GB of cloud storage and a password manager that guards login information to keep your data safe and accessible from all your devices. Our system optimizer deletes private information and improves device performance. So you will have plenty of room for your music, documents, photos, and movies. Where many of Webroot’s internet security competitors rely on downloading malware definitions straight to your device, analyzing and classifying them before being able to identify them, we store them in the cloud and are able to identify them in real time – as soon as they appear. This allows Webroot to maintain a small endpoint agent that acts as the console on your device. It installs fast, scans fast, and benefits from a more robust threat library than any of our competitors. Not all virus protection is created equal, superior threat intelligence creates a superior antivirus and antimalware product. As activities like shopping, banking, and financial planning continue to migrate to the web, the risk of cybercrime is on the rise. The features that help keep you safe - like password management, mobile security, and identity and privacy protection - aren't included in most free protection. With more than 250,000 new malicious programs appearing each day it is important you protect yourself and know that malware may refer to many different forms of hostile, intrusive, or intentionally harmful programs including: Phishing attacks, virus, adware, rootkits, key loggers, boot kids, payloads, worms, backdoors, exploits, spyware, ransomware, screen scrapers, scareware and more. When it comes to protecting you and your family's devices, you get what you pay for. There's Always a New Cybersecurity Threat - Let Webroot Help Nearly half of all consumers worldwide have been victims of cybercrime. Every link clicked, email opened, app downloaded, and network joined is an opportunity for hackers to compromise your personal data. Even established threats like ransomware are continuously evolving, and new threats like cryptojacking are being added to an already diverse threat landscape. Webroot offers complete protection from viruses and identity theft for all your devices, without slowing you down. Powerful, lightweight, integrated protection for PC, Mac and Android, cloud-based Webroot antivirus protects personal information by blocking the latest malware, phishing, and cyber-attacks. Being fully cloud-based allows Webroot to complete scans faster than our competitors, we scan billions of apps, files, and websites continuously to determine where and what is safe online. With real-time updates, Webroot protects against known and zero day threats. 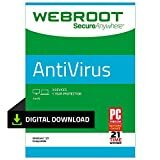 Where many of Webroot’s Antivirus internet security competitors rely on downloading malware definitions straight to your device, analyzing and classifying them before being able to identify them, we store them in the cloud and are able to identify them in real time – as soon as they appear. This allows Webroot to maintain a small endpoint agent that acts as the console on your device. It installs fast, scans fast, and benefits from a more robust threat library than any of our competitors. Not all virus protection is created equal, superior threat intelligence creates a superior antivirus and anti-malware product. As activities like shopping, banking, and financial planning continue to migrate to the web, the risk of cybercrime is on the rise. The features that help keep you safe - like password management, mobile security, and identity and privacy protection - aren't included in most free protection. With more than 250,000 new malicious programs appearing each day it is important you protect yourself and know that malware may refer to many different forms of hostile, intrusive, or intentionally harmful programs including: Phishing attacks, virus, adware, rootkits, key loggers, boot kids, payloads, worms, backdoors, exploits, spyware, ransomware, screen scrapers, scareware and more. When it comes to protecting you and your family's devices, you get what you pay for. Browse, bank and shop safely with McAfee AntiVirus, award-winning protection for your PC whenever you’re online. With a quick install, it blocks threats using antivirus that’s verified by independent tests—now backed by our 100% Guarantee: a McAfee expert will remove a virus, or your money back! Additional terms apply. * Plus it helps you avoid threats before they become a problem with essential features like safe web browsing, firewall security, and more. PRE-PAID SUBSCRIPTION This product is for new Norton subscriptions only, at an introductory price. * Instantly download & install to protect up to 5 PCs, Macs, iOS or Android devices in minutes! REAL-TIME THREAT PROTECTION Advanced security that helps defend against existing and emerging malware to your devices, and helps protect your private and financial information when you go online. Norton 360 Deluxe gives you comprehensive malware protection for up to 5 PCs, Macs, Android or iOS devices, including 50GB of secure cloud backup for PC and Secure VPN for your device. Auto-renewal enrollment with payment method is required for activation and use. * We will store your payment details but you won’t be charged until your next renewal period. You will get an email reminder before renewal and can cancel your automatic renewal at any time. Also included are additional features such as SafeCam that alerts you and blocks unauthorized access to your PCs’ webcam, and Dark Web Monitoring powered by LifeLock, where we monitor and notify you if we find your personal information on the dark web. STAY PROTECTED EVERYWHERE you go, at home, in a café, at the airport-everywhere-on ALL YOUR DEVICES, with cloud-based protection against viruses and other online threats. As the #1 TRUSTED PROVIDER OF THREAT INTELLIGENCE, you know you're in good hands. Stay safe from viruses, ransomware, phishing, and more. PREMIUM FEATURES: Encrypts and protects passwords and account information for all your devices so you can stay protected wherever you are. Nearly half of all consumers worldwide have been victims of cybercrime. Every link clicked, email opened, app downloaded, and network joined is an opportunity for hackers to compromise your personal data. Even established threats like ransomware are continuously evolving, and new threats like cryptojacking are being added to an already diverse threat landscape. Webroot offers complete protection from viruses and identity theft for all your devices, without slowing you down. Powerful, lightweight, integrated protection for PC, Mac and Android, cloud-based Webroot Internet Security Plus with antivirus protects personal information by blocking the latest malware, phishing, and cyber-attacks. Being fully cloud-based allows Webroot to complete scans faster than our competitors, we scan billions of apps, files, and websites continuously to determine where and what is safe online. With real-time updates, Webroot protects against known and zero day threats. Internet Security Plus boasts added features such as a password manager that guards login information to keep your data safe and accessible from all your devices. So you will have plenty of room for your music, documents, photos, and movies. Where many of Webroot’s internet security competitors rely on downloading malware definitions straight to your device, analyzing and classifying them before being able to identify them, we store them in the cloud and are able to identify them in real time as soon as they appear. This allows Webroot to maintain a small endpoint agent that acts as the console on your device. It installs fast, scans fast, and benefits from a more robust threat library than any of our competitors. Not all virus protection is created equal, superior threat intelligence creates a superior antivirus and anti-malware product. As activities like shopping, banking, and financial planning continue to migrate to the web, the risk of cybercrime is on the rise. The features that help keep you safe - like password management, mobile security, and identity and privacy protection - aren't included in most free protection. With more than 250,000 new malicious programs appearing each day it is important you protect yourself and know that malware may refer to many different forms of hostile, intrusive, or intentionally harmful programs including: Phishing attacks, virus, adware, rootkits, key loggers, boot kids, payloads, worms, backdoor, exploits, spyware, ransomware, screen scrapers, scareware and more. When it comes to protecting you and your family's devices, you get what you pay for.